The massive contraption, not a new Mars rover but a 28-wheeled vehicle ALMA transporter known as an Otto, is used to move ALMA antennas among the various locations on the Chainantor Plateau in the Atacama Desert of Chile. While this may look like a colossal new rover for trekking around the Red Planet, it is not. 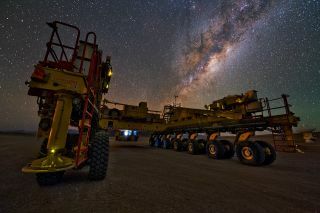 This enormous machine bathed in the light of the Milky Way in the Atacama Desert of Chile is actually an transporter for the giant ALMA radio telescope affectionately known as an Otto. The massive vehicle measures more than 65 feet (20 meters) long and 32 feet (10 meters) wide with 28 wheels. The transporter moves the ALMA antennas from the Operations Support Facility at about 9,514 feet (2,900 meters) above sea level to the Chainantor Plateau at 16,404 feet (5,000 meters) above sea level, as well as among the array of locations where the antennas are positioned. The device, created in Germany, weighs in at 286,601 lbs. (130 metric tons) and can move only up to 7.45 miles (12 kilometers) per hour while carrying an antenna. Because this is a delicate process, speed is not as important as safety and precision. Even with the tremendous size and power of the apparatus, the Otto positions each antenna on its foundation pad perfectly, with an accuracy of within a few millimeters.